No marriage before age 18? House committee meets bill sponsor partway with amendment allowing the courts to decide. 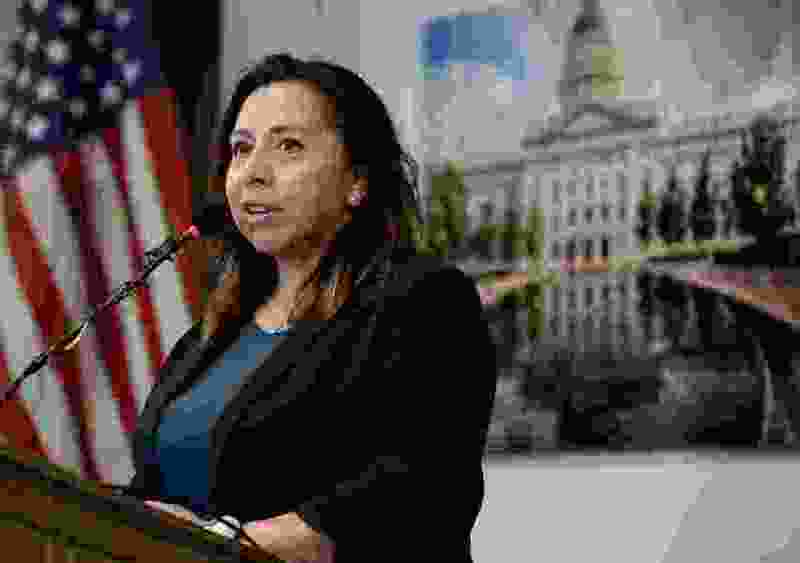 (Francisco Kjolseth | Tribune file photo) Rep. Angela Romero, D-Salt Lake City, discusses legislation during a press event at the Calvin Rampton Complex in Taylorsville on June 6, 2018. Romero is sponsoring a bill that would prohibit marriages by minors in the state. When Heidi Clark became pregnant at age 16, she was, she says, “young, naive and in love” and, legally, a child. Her boyfriend was told he’d be excommunicated from his church over the relationship, and obtaining parental consent to an underage marriage was “easy," Clark says, so she was wedded a few weeks after her 17th birthday. Her marriage turned abusive to the point that Clark says she nearly lost her life after being raped and strangled. She shared her story Monday during a hearing of the House Judiciary Committee of the Utah Legislature. Her testimony was by way of asking lawmakers to support a bill, HB234, that would ban all underage marriages in the state. Current law allows children as young as 15 to marry with a parent’s consent and the permission of a juvenile court judge. At age 16, only a parent’s consent is required. Committee members were unwilling to ban all underage marriages, and opted instead to unanimously support a substitute version of HB234 that would allow marriages at age 16 if a juvenile court judge grants permission. The bill does not specify how a judge is to evaluate those requests, instead granting broad judicial discretion. Romero welcomed the substitution during the committee hearing, and said after the vote that the bill could be improved by an amendment on the House floor that would further restrict underage marriages to individuals within 7 years of each other’s age. Nicholeen Peck of the Worldwide Organization for Women spoke against the bill. She said the door should remain open for pregnant minors to marry and pointed to her own experience as a teenage bride to argue that individuals achieve emotional and intellectual maturity at different times of life. “Each person’s situation can be very uniquely different,” Peck said. Peck said she was 18 when she was married — and her husband was 24 — meaning her experience would not have been affected if HB234 was law at the time. Committee members briefly considered amending the bill to include a 7-year age gap, with Rep. Brian King, D-Salt Lake City, ultimately withdrawing his own motion in order to better prepare his intended language for consideration on the House floor. Rep. Cheryl Acton, R-West Jordan, had also earlier raised the subject of an age gap as a more palatable tool than a minimum age to address the concerns surrounding teenage marriages. “Most of us probably know people who married very young and it did work out," Acton said. Romero said she was optimistic about the bill’s chances of success during the 2019 legislation session, which concludes on March 14. While she ultimately hopes to increase the minimum age to 18, she said the current version of HB234 bill protects 15-year-olds who no longer would be legally able to marry if her bill is implemented. “A child should be a child,” Romero said.